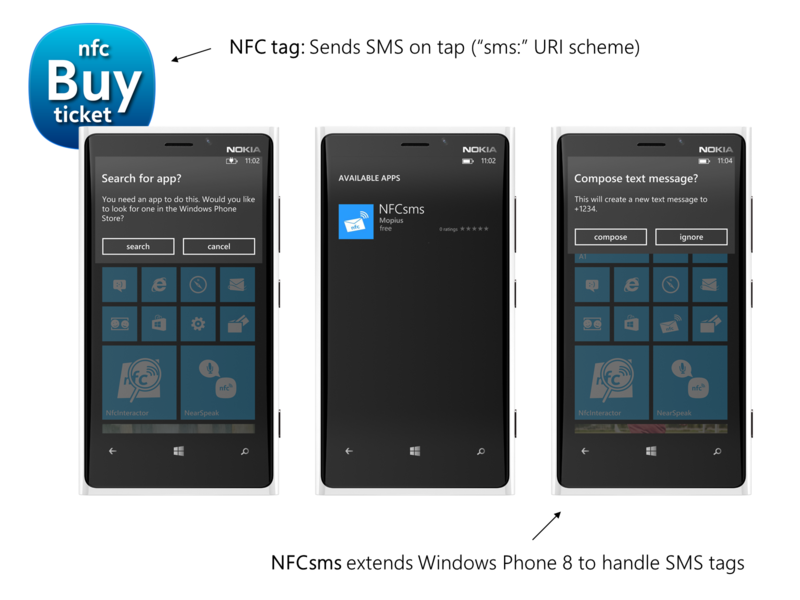 NFCsms extends the Windows Phone platform to enable sending SMS messages from NFC tags and web links. What are SMS NFC Tags? When you tap an NFC tag, it can ask your phone to send a message to a pre-defined number. This is frequently used: for example in Helsinki (Finland) and Vienna (Austria), some public transport stations have NFC tags that allow users to query bus schedules or to buy a ticket. Instead of requiring an app for each platform, the tags simply trigger the default messaging app on the phone; the service then responds by an SMS answer. Through premium SMS, you can even purchase small services, like public transport tickets. SMS links are formatted according the the SMS URI scheme, as standardized in RFC 5724. A valid SMS URI is for example: “sms:+1234?body=Hello%20World”. Note that the scheme does not include “//” – “sms://+1234” is not correct (NFCsms can nevertheless correctly handle those links). Most operating systems support SMS tags / links out of the box – including Android, Symbian and the Nokia N9 with MeeGo Harmattan. Windows Phone 8 does not come with support for SMS tags – however, NFCsms extends the platform to enable sending SMS messages through the standard WP8 messaging app. Installing NFCsms is a seamless experience. If the user taps an NFC tag that contains SMS information, Windows Phone will automatically search the Store for compatible apps – the free NFCsms app will appear and can be installed. From now on, WP8 is compatible to SMS tags. Tapping an NFC tag will show the correct “Compose text message?” prompt. If the user accepts, the phone’s messaging app will be opened immediately, allowing to review the number & contents and to send the message. NFCsms always stays in the background – the app does not get visible during the process, as it immediately redirects to the default messaging app in order to provide the best possible user experience. You can download the free NFCsms app for all NFC capable Windows Phone 8 devices from the Windows Phone Store. Interested in writing SMS tags with your Windows Phone? Download Nfc Interactor!